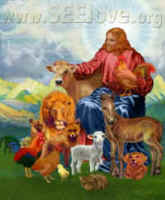 Some have asked me why I’ve written this essay series for a Christian vegetarian e-newsletter. For one thing, Rene Girard and his students have offered a way to understand the Bible that is well-grounded in the social sciences. As a scientifically oriented person, I find the Bible much more “reasonable” and “believable” when it accords with our best scientific understanding of the world around us. I think mimetic theory and the scapegoating mechanism are powerful tools for understanding the human condition. Humans are caught in a bind between desperately seeking self-esteem by overcoming rivals in competition for objects of desire (which leads to rivalries, envy, bitterness, and violence), and simultaneously needing to live peacefully in communities. Mimetic theory helps us understand rivalries, and the scapegoating mechanism is the means by which communities have maintained peace since the beginning of human civilization. Second, many people have found this series illuminating. As previously offered, I will consider publishing the thoughts of those who disagree with any aspect of this series. I wish to stress that one does not need to agree with these “Girardian” essays to conclude that Christianity supports vegetarianism. Third, theologies that attribute violence and destructiveness to God make it much easier to justify violence today “in the name of God.” Claiming to know “God’s will,” Christians have often called their violence (which is often self-serving) righteous. This makes it easier to understand how many Christians who have regarded God as generally loving and compassionate could still endorse violence against all kinds of vulnerable individuals, including people of color, women, and animals. Looking at the Bible with a “Girardian” lens helps us understand 1 John 4:8 “God is love”; violence and suffering reflect human fallenness and are not of divine origin. Fourth, we recently completed the most homicidal century in human history. The prospect for world peace is no better today, and modern weaponry has made war even more terrifying than in the past. Meanwhile, the number of animals treated with cruelty at human hands is unprecedented in human history. The problem is greatest in the predominantly Christian, Western nations. As this series evolves, I hope to make clear that the Christian revelation offers a distinctive, if not unique, solution to the problem of human violence. Furthermore, I am doubtful that any other proposed solution will work. Consequently, I see the very survival of humankind, and of the world as we know it, as likely depending on whether humankind receives Christ’s message of love and compassion. As always, I welcome feedback on this series. Next week, we will turn to the Passion story.